According to the 2010 Global Burden of Disease Study, Stroke categorised under Cardiovascular and Circulatory Diseases, is the second leading cause of death globally and the third leading cause of premature death and disability as measured in Disability Adjusted Life Years (DALY). Cerebrovascular disease is the largest neurologic contributor and accounts for 4.1% of total global DALY. Global burden of disease (GBD) measures burden of disease using the DALY. 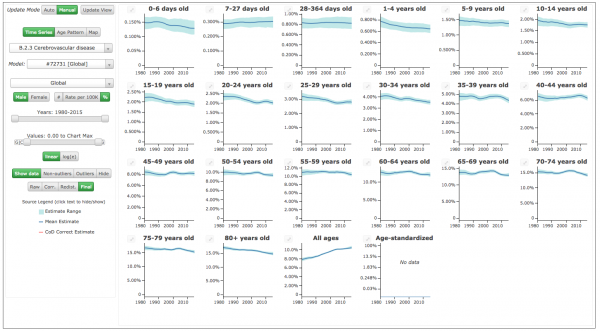 This time-based measure combines years of life lost due to premature mortality and years of life lost due to time lived in states of less than full health. The DALY metric was developed in the original GBD 1990 study to assess the burden of disease consistently across diseases, risk factors and regions. The global burden of Stroke is increasing globally. Feigin et alanalysed the Global and Regional Burden of Stroke between 1990-2013 and provided an update on the incidence, prevalence, mortality, disability-adjusted life years (DALYs) and years lived with disability (YLDs). Although age-standardised rates of stroke mortality have decreased worldwide, the absolute number of people who have a stroke every year, stroke survivors, related deaths, and the overall global burden of stroke (DALYs lost) are great and increasing. Further study is needed to improve understanding of stroke determinants and burden worldwide, and to establish causes of disparities and changes in trends in stroke burden between countries of different income levels. You can explore country specific visual and statistical data in relation to Stroke at a "Causes of death visualisation" tool on The Lancet. The worldwide burden of haemorrhagic stroke (HS) has increased over the last 2 decades in terms of absolute numbers of HS incident events. The majority of the burden of HS is borne by LMIC. Rates for HS incidence, mortality, and DALY lost, as well as MIR decreased in the past 2 decades in HIC, but increased significantly in LMIC countries, particularly in those patients 75 years. HS affected people at a younger age in LMIC than in HIC. The lowest incidence and mortality rates in 2010 were in High Income North America, Australasia, and Western Europe, whereas the highest rates were in Central Asia, Southeast Asia, and sub-Saharan Africa. Although age-standardized ischaemic stroke (IS) mortality rates have declined over the last 2 decades, the absolute global burden of IS is increasing, with the bulk of DALY lost in LMIC. Tobacco consumption is an important modifiable risk factor for IS, and in both 1990 and 2010, the top ranked countries for IS deaths that could be attributed to tobacco consumption were China, Russia, and India. Tobacco control policies that target both smoking initiation and smoking cessation can play an important role in the prevention of IS. In China, Russia, and India, even modest reductions in the number of current smokers could see millions of lives saved due to prevention of IS alone. Feigin et alsuggest that more than 90% of the stroke burden is attributable to modifiable risk factors, and achieving control of behavioural and metabolic risk factors could avert more than three-quarters of the global stroke burden. Air pollution has emerged as a significant contributor to global stroke burden, especially in low-income and middle-income countries, and therefore reducing exposure to air pollution should be one of the main priorities to reduce stroke burden in these countries. Identification and adequate management of risk factors are key to preventing any disease or injury. Heart conditions such as coronary heart disease, cardiomyopathy, heart failure, and atrial fibrillation can cause blood clots that can lead to a stroke. Age and gender - your risk of stroke increases as you get older. At younger ages, men are more likely than women to have strokes. However, women are more likely to die from strokes. Women who take birth control pills also are at slightly higher risk of stroke. Race and ethnicity - strokes occur more often in African American, Alaska Native, and American Indian adults than in white, Hispanic, or Asian American adults. Personal or family history of stroke or TIA. Use of nonsteroidal anti-inflammatory drugs (NSAIDs), but not aspirin, may increase the risk of heart attack or stroke, particularly in patients who have had a heart attack or cardiac bypass surgery. The risk may increase the longer NSAIDs are used. Many factors are relevant in prioritising strategies to reduce risks to health. These include the extent of the threat posed by different risk factors, the availability of cost-effective interventions, societal values, culture and preferences. Risk assessment and estimates of the burden of disease resulting from different risk factors may be altered by many different strategies. Ovbiagele & Nguyen-Huynh highlight the role of epidemiological studies in identifying groups of individuals or regions at higher risk for stroke, which they believe can also help us better understand the natural history of stroke and therefore push the direction of therapeutic investigations. In many countries and regions, Stroke Registers, are now being used to gain a greater understanding of the prevalence of Stroke and assist with research and service planning. These registers are databases of clinical information, with the primary aim being collection of key data items to provide information on the quality of care for individual patients with stroke and transient ischaemic attack (TIA) in order to provide high-quality information to identify areas where improvements in quality of care should be prioritised, reduce variations in care delivery and, ultimately, provide evidence of reduced deaths, disability, and recurrent stroke. Is there a Stroke Register in your Country? Do you keep a register within your practice of individuals with Stroke in order to plan for future service requirements? ↑ Mathers C, Fat DM, Boerma JT. The global burden of disease: 2004 update. World Health Organization; 2008. ↑ 2.0 2.1 Feigin VL, Forouzanfar MH, Krishnamurthi R, Mensah GA, Connor M, Bennett DA, Moran AE, Sacco RL, Anderson L, Truelsen T, O'Donnell M. Global and Regional Burden of Stroke during 1990–2010: Findings from the Global Burden of Disease Study 2010. The Lancet. 2014 Jan 24;383(9913):245-55. ↑ 3.0 3.1 Feigin VL, Krishnamurthi RV, Parmar P, Norrving B, Mensah GA, Bennett DA, Barker-Collo S, Moran AE, Sacco RL, Truelsen T, Davis S. Update on the global burden of ischemic and hemorrhagic stroke in 1990-2013: the GBD 2013 study. Neuroepidemiology. 2015 Oct 28;45(3):161-76. ↑ Krishnamurthi RV, Moran AE, Forouzanfar MH, Bennett DA, Mensah GA, Lawes CM, Barker-Collo S, Connor M, Roth GA, Sacco R, Ezzati M. The global burden of hemorrhagic stroke: a summary of findings from the GBD 2010 study. Global heart. 2014 Mar 31;9(1):101-6. ↑ Krishnamurthi RV, Barker-Collo S, Forouzanfar MH, Naghavi M, Connor M, Lawes CM, Moran AE, Anderson LM, Roth GA, Mensah GA. 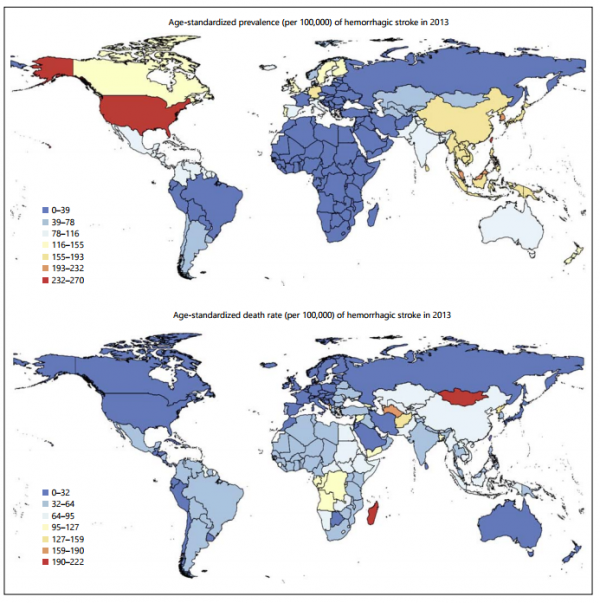 The global burden of ischemic stroke: findings of the GBD 2010 study. Global heart. 2014 Mar 31;9(1):107-12. ↑ Ovbiagele B, Nguyen-Huynh MN. Stroke Epidemiology: Advancing our Understanding of Disease Mechanism and Therapy. Neurotherapeutics. 2011 Jul 1;8(3):319.